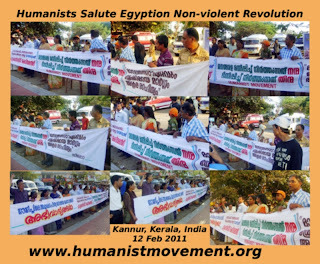 ‘Humanists salute the people of Egypt’ - a solidarity campaign organised by the Humanist Movement in Kannur [Kerala, India] stadium corner on 13th Feb 2010. It was a one hour program organized at short notice, to Congratulate the people in Egypt on Mubarak’s resignation from power. We understood the Egyptian revolution as a voluntary non-violent-protest without being lead by any traditional leader/s or any clerics. And it was a revolution without any blood-shed. 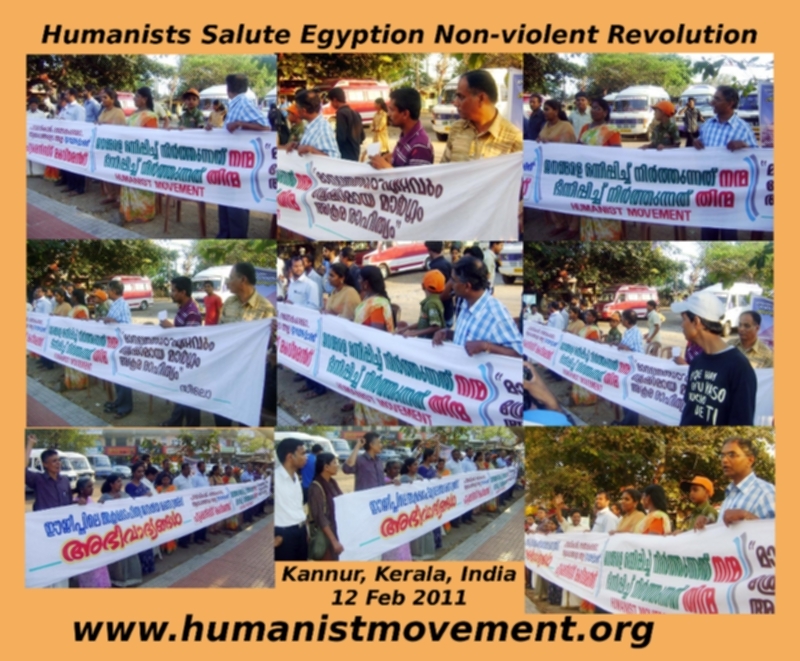 We began our program with slogans against authoritarian regime and promotion of non-violent struggle by the people of TUNISYA, EGYPT, YEMEN & elsewhere in the world. People were holding long banners expressing solidarity with the people of Egypt and a banner with some quotations from SILO's works. 1- These new struggles we see are the symptom of the collapse of centralised structure which started from the erstwhile Soviet empire and has now reached Egypt. 2- It is an indication of the new sensibility which is being born today all over the world, which rejects the old world and paves the way for new world. After our program we conducted a ceremony for sending good feelings to our members, and the people in Egypt.